Staging is probably one of the most overlooked pieces of a successful event - and it is certainly the most dangerous to transport and set up! This is something you definitely want to leave to the professionals. 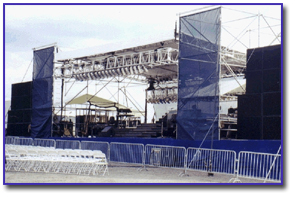 At Performance Production Services, Inc., we've had plenty of experience with setting up staging and rooftops. We've got the scars to prove it! We've done choral risers for Houses of Worship, large stages with rooftops for outdoor festivals, and specialty stages, including colored and varying shape stages. Contact us to find out how we can help you with your staging needs!